I feel so lucky that Textile Center, a national center for fiber art, is in my hometown, Minneapolis. I take advantage of this wondrous place at least once a week – I attend a drop-in textile group, I teach, I shop, I look at and study the gallery exhibitions, I shop, I take workshops, I dye, I shop, I borrow books from the splendid library. Did I mention the Garage Sale? Textile Center is a place and a resource I will never tire of. I was familiar with Textile Center when about five years ago, Scotty Gillette and I decided to start a drop-in group of beaders, knitters, quilters, and rug hookers, who meet every Tuesday morning to work—and talk and laugh and catch up on what’s going on. Like many who use the wonders that Textile Center offers, I grew up sewing my own clothes, knitting long awkward scarves, embroidering jean jackets, and wishing I could make a basket out of willow branches. 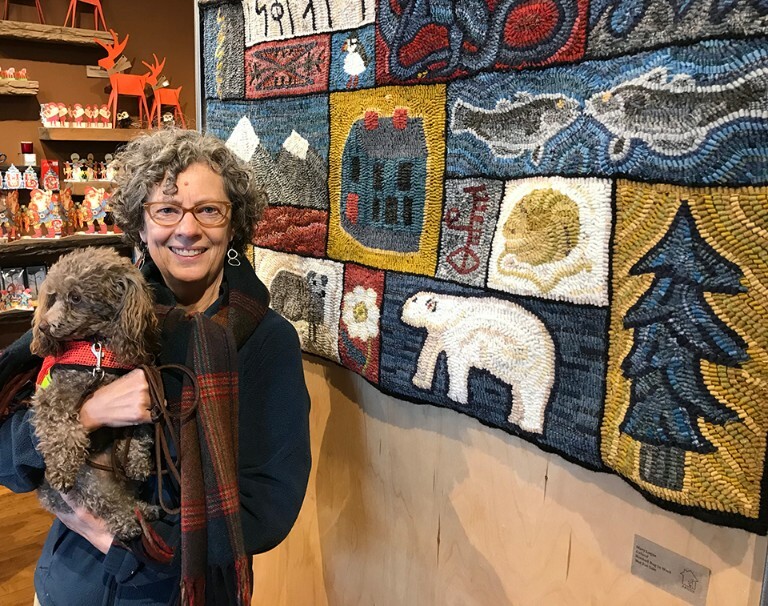 In my forties, I was introduced to rug hooking and found a textile art that suited me to a “T” – it involved thrifting fabric, gathering plants to dye it, and developing a somewhat naïve drawing style for patterns. It is a meditative way to keep my hands busy – and most wonderfully of all, it produces an end product that I can put on the floor, hang on the wall, make a pillow, maybe even use as illustrations for a book. The cross-pollination that takes place at Textile Center is inspiring, nourishing, and filled with magic. It’s the kind of magic we think is all about being lucky—until we realize that a place like this needs to be supported and funded. And that’s why I’m writing this letter. And that’s why I invite all of you who have a story similar to mine – a love of textiles, a desire to support fiber art, and a sense that the need for warm and uplifting places to gather is more necessary than ever – to support Textile Center’s annual fund. Artists and teachers like Mary Logue are among the many reasons Textile Center thrives. This spring she taught an 8-week Interlace rug hooking workshop. Funded in part by Aroha Philanthropies’ “Seeding Vitality Arts MN” program, our new Interlace workshops “inspire and enable older adults to learn, make, and share the arts in ways that are novel, complex, and socially engaging.” Mary received rave reviews from the students in her sold-out workshop. Give appreciated stocks, bonds, or mutual fund shares (which may be more tax efficient than cash). Make a qualified charitable distribution from your IRA. The IRA Charitable Rollover law allows those 70½ and older to give up to $100,000 without paying federal income tax upon withdrawal. Ensure your contribution goes further by choosing to make your online gift “sustaining,” and your credit card will be charged monthly. Learn more about the Leadership Circle, a special category of donation, here.